Our first-ever scorecard of US utilities, released today, reveals striking regional differences and identifies the best — and worst — performers on energy efficiency. 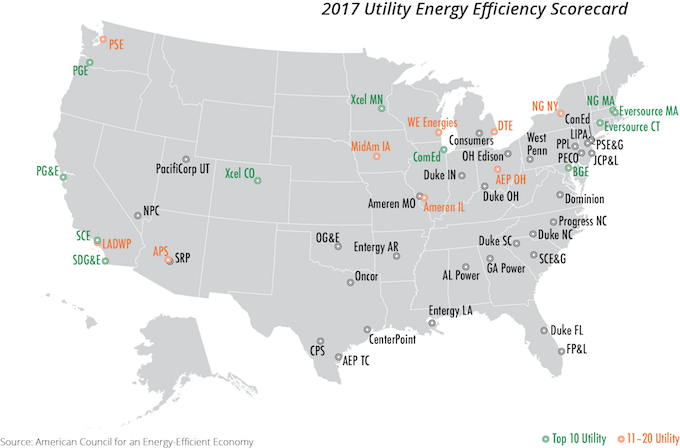 The 2017 Utility Energy Efficiency Scorecard looks at the performance of the 51 largest electric utilities in the United States and highlights cutting-edge efforts. Topping the list are Eversource Massachusetts and National Grid Massachusetts, which both earned the same score. Rounding out the top five are Pacific Gas & Electric, Baltimore Gas & Electric, and Eversource Connecticut. Map showing the utilities in the scorecard, denoting the top performers. Utilities are the primary providers of energy efficiency programs for US electricity customers. These programs deliver enormous benefits to households and businesses. Efficiency lowers customer bills, allows utilities to avoid or defer building new power plants or other infrastructure, and reduces local pollutants associated with electricity generation. We wanted to dig further into this topic to determine which utilities are doing the best on energy efficiency programs and how others can improve. Typical programs encourage the purchase of efficient appliances, lighting, and heating, ventilation, and cooling (HVAC) — both at home and in other places such as commercial kitchens and restaurants. Leading utilities sometimes undertake 20 or more efficiency programs. Only a few utilities take some of the more forward-thinking approaches such as promoting smart thermostats, residential geo-targeting, zero net energy buildings, and advanced space-heating heat pumps. This report, the newest addition to our Scorecard series, is a first-of-its-kind deep dive into utility-sector energy efficiency efforts. It provides an important data baseline to assess energy efficiency in the utility sector. At the top of the list, Eversource Massachusetts and National Grid Massachusetts both earn 91% of total points. Both achieved more than 3% savings as a percentage of their retail sales in 2015 — a notable achievement. The top 10 show impressive commitment to efficiency through a wide range of long-term programs and policies. Some regions scored much better than others. Utilities in the Northeast, the highest-scoring region, earned, on average, 62% of total points, followed closely by those in the West, which earned 57%. The Northeast average is more than twice that of utilities in the Southeast, the lowest-scoring region, and nearly twice that of utilities in the mid-Atlantic. Five of the bottom 10 utilities are in the Southeast, and seven of the top 10 are in either the Northeast or the West. The top 10 invested a higher percentage of total revenue on energy efficiency. They spent an average of 6% of revenue on efficiency programs; the bottom 10 invested an average of 0.7%. The overall average was 2.7%. Utilities saved more energy than they planned. On average, they saved 0.89% of retail sales, compared to the average target of 0.77%. The top utilities are located in the top-performing states. Nine of the top 10 utilities are located in states that also break the top 10 in our State Scorecard. The 51 utilities, on average, used efficiency programs to reduce by 0.79% the peak demand for power, which is typically the costliest to generate. The most common efficiency programs were residential HVAC and industrial and commercial custom measures. 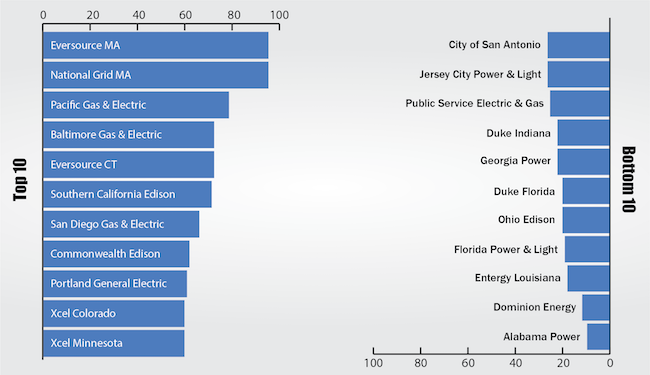 Three Texas utilities scored in the top 10 on the low-income program metric. This includes CPS Energy, which directed more than half of its portfolio expenditures to low-income programs. Thirty-nine utilities earned a point for offering residential time-of-use rates. Arizona Public Service and Salt River Project in Arizona have high subscription levels; more than half (51%) of the former and nearly a third (31%) of the latter subscribe to these rates. Fewer than half (24) of utilities earned full points for evaluation, measurement, and verification (EM&V), which can increase savings by providing guidance on how to improve programs. Overall, scores vary widely among the 51 utilities, leaving a lot of room for improvement. The five utilities with the most room to grow are Ohio Edison, Florida Power and Light, Entergy LA, Dominion Energy, and Alabama Power. The report shows impressive and exemplary utility commitment to offering customers energy efficiency services. The findings underscore that state and regulatory support as well as company commitment are critical for high achievement. We are pleased to provide this snapshot of utility-sector efficiency and hope it will help promote effective program design and implementation. Tune in next week to our webinar, where we’ll dive even more deeply into the results of the Scorecard with additional reactions from regional energy efficiency organizations across the United States. We developed metrics that span a wide range of vital utility-sector efficiency programs and performance, each with a point value relative to its importance to utility-sector energy efficiency. We focus on 2015 performance but also on long-term planning and innovation, which are critical to the continued inclusion of energy efficiency as a utility resource. The metrics aim to evaluate performance in a specific utility service territory, although we recognize that utilities operate under complex regulatory and policy landscapes. The report, which received no utility funding, focuses on the 51 largest electric utilities by retail sales volume. It specifically looks at state jurisdictional utilities rather than parent or holding companies. We include utility-funded programs, both those operated directly by utilities and those operated by third-party administrators with funding from utilities. We collected public utility filings, reports, and documents to create an initial data set, and worked with utility and other contacts to fill in gaps and confirm data. In some cases, data was adjusted for accurate comparison across utilities. All 51 utilities were provided the opportunity to review the report before its publication.